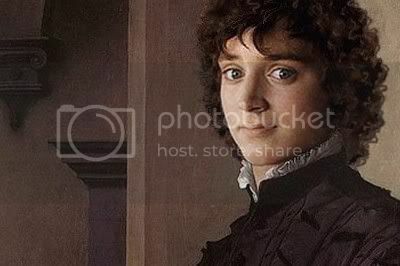 ~ Detail of Frodo in Bronzino's "Portrait of an Unknown Man"
Oh my, this is so great. And it seems the real thing. I had a look at your other manips, I found all of them stunning. And it is amazing how Frodo's face is so perfect, pure and beautiful that it fits well in every contest. Film-Frodo has such a wonderfully classic face, besides being just plain beautiful, it seemed inevitable to want to see him portrayed in the costumes and look of other eras (besides what Ngila Dickson created for the hobbits of M-E). What better way than to insert him into works of art? I sometimes admonish myself that I am simply playing an elaborate form of "paper dolls". Oh! Lovely, just beautiful. Frodo does lend so well to these old paintings, does he not? Came here via a rec, BTW. Thank you! I'm pleased as punch that you could drop by. Frodo loves being admired in fancy dress of any era (or no dress at all in the case of some of the Art Travesties *smirky grin*). If you hadn't noticed, there is a pair of links at the bottom of every Art Travesty entry, one to hook up to the Photobucket Album that has all of them in a gallery (titles and artists for the source images are given if you click them open), and a link to a "table of links" to those manips that have been featured in journal entries. These tell a lot more about the source image, why I chose it, etc. You are so welcome, Jane[janejane]! Your friend sounds like she has an imagination I can relate to in our shared desire to see Frodo featured in other eras, other garbs, just for the pleasure of seeing every facet of his classical beauty shown off. While some of my manips were dashed off just for laughs to illustrate humorous posts, some of them came out beautifully. Oh yes indeed, Ismenin has placed Elijah and Dom in Ancient Egypt and historic Ireland and now Lij is an Inca God King and Dom a Spaniard... All very interesting! Have you read her fics? I enjoy visiting art galleries and it's fascinating to see my favourite man's beautiful face manipped into some famous works of art! No, I don't mind removing the visual film-Frodo to other places and times but when it comes to the written word, I haven't read any fics that aren't set in the canon Shire (or wanted to). Perhaps one day when I have read all those, I'll get around to the AU ones, LOL. There's a lot of fic out there, though!